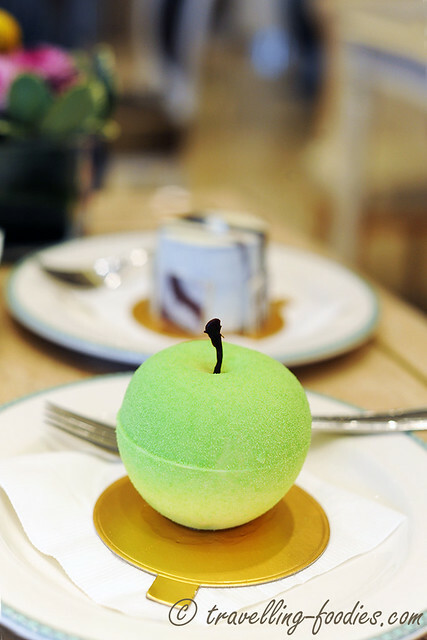 帝苑餅店 Fine Foods is a French styled patisserie located in The Royal Garden, a five-star hotel in Tsimshatsui Hong Kong. Located at a corner of the hotel lobby, our first impression was how spacious it was compared to some other joints we’d been. Well, the latter can hardly be faulted as prime land and shop space in Hong Kong is really worth their price in gold. Primarily as a takeaway store, there are limited tables available for dine-in, i.e. three within the pastry shop and another four or so located just outside. We preferred and opt to dine-in (which comes with an additional 10% service charge as always) at one of the tables outside as it is quieter, probably a much better environment to enjoy the pastries, accompanied by the soothing piped-in music from the hotel lobby. 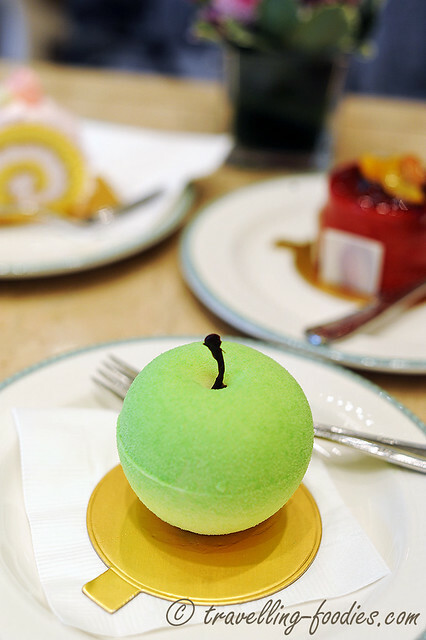 We tried four of Fine Foods’ pastries, which is helmed by Executive Pastry Chef Louie Ma See Lok. This is the first time we are sampling their creations but not our first time at Fine Foods incidentally. 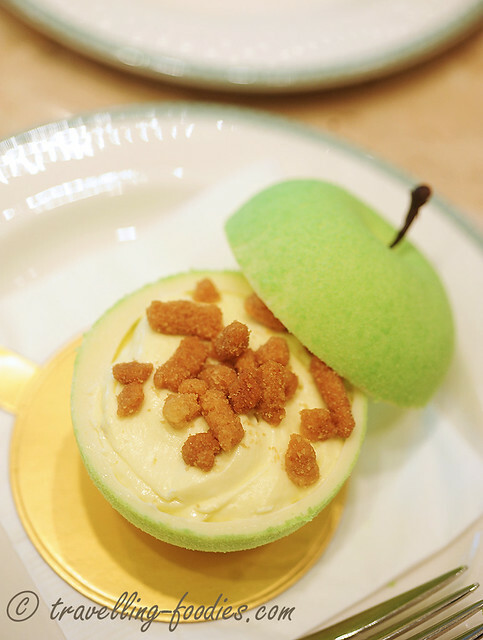 We came here on the second last day of our trip to Hong Kong last year as well, only to be disappointed as their signature “Green Apple rare cheesecake” was sold out by the time we arrived. We left empty-minded. So this time round, we did our “homework” and made sure that we were here on the dot when this piece is to be rolled out. 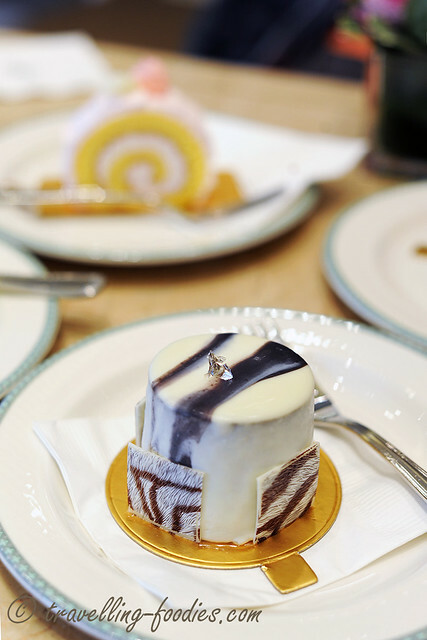 However, it is not without some “sacrifices”, as the other selection we had in mind, like their Mont Blanc and Mango Tart had already been sold out. Yes, pastries move very fast here at Fine Foods as only limited pieces are made each time. The “time slots” for some of the more popular items are staggered to ensure that walk in customers have something to look forward to whatever time they come. So why is the “Green Apple” so popular? Well, its physical appeal must surely have much to do with it. Moulded out of white chocolate to resemble the actual fruit, each piece is sprayed with a coat of green cocoa butter and given a dark chocolate decor as the pedicel to make it look realistic. Yet it doesn’t reveal much of its contents, lending a shroud of anticipation to what lies beneath, quite literally. Remove the top half of the white chocolate mould, one is hidden begins to unfold – a deconstructed “rare cheesecake” awaits to be savoured . What is typically the buttery pastry base is now “turned over” and sprinkled on top as “croustillantes” while the body, i.e. unbaked creamcheese which had been whipped until it is so light and airy takes on the filling. As an element of surprise, there is a layer of apple gelee with morsels of cooked apple hidden underneath the creamcheese layer. A tart variety, like Granny Smith or French Delicious was used make it delightfully refreshing. Our only grouse is the white choocolate moulded piece. It is far too sweet to be enjoyed on its own and like us, I’d noticed that many others who came to enjoy this piece gladly devoured the contents but left the shell largely untouched. I can’t help but wonder if the white chocolate could have been put to better use instead. 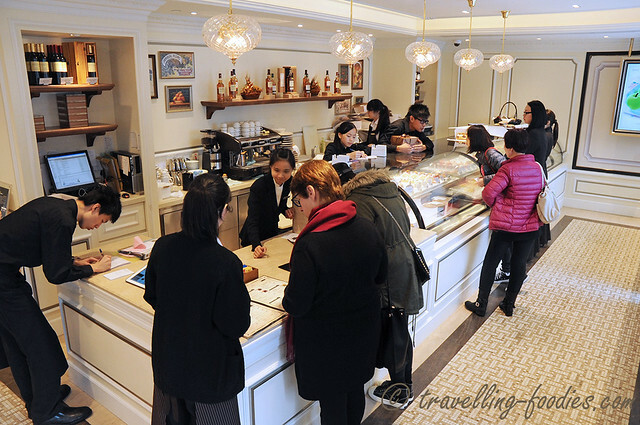 The Vanilla and Sesame Gateau is one of the pieces recommended by the staff when we asked what is good from what’s left in their selection after the Mont Blanc and Mango Tart had been sold out. She said it is her “next favorite piece” after the “Green Apple” and we took her word for it. With a bit of skepticism, we ordered it, wonderfully if the pairing would work. It is surprisingly delicious. I was skeptical because both flavours are rather strong and I was wondering if they would conflict more than to compliment each other. The pairing worked rather well. Firstly, the pastry work is rather neat. 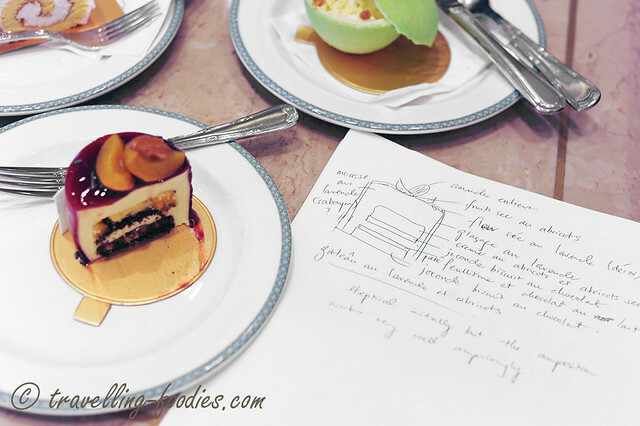 The glaze was thin and the vanilla mousse layer was presentably symmetrical. 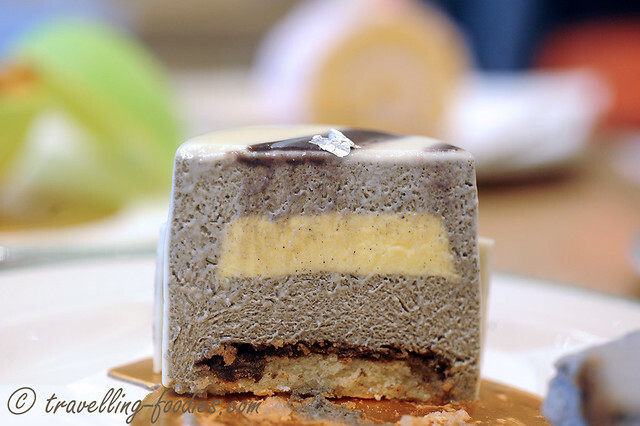 The black sesame mousse is very apparent and aromatic but not overpowering as what I had expected it to be. fearing the worst. It kind of reminds of the popular Cantonese “tung shuei” dessert soup 芝麻糊, in a pleasant way. It is not too sweet, allowing the flavours of the vanilla to be carried through and end it off nicely. The mousse layers are very well made. Not quite Sugino-standard but still very delectable without the cloying textures of having too much gelatine like some other pieces we’d had before. Then we had another piece which also carried an interesting pairing of flavours, an Apricot and Lavender Gateau. The flavours reminds of Provence in southern France at a time around now in a year, in early summer when lavender would be in full bloom while stone fruits like apricots and peaches are in season. I wonder if Chef Louie was thinking what I’m thinking when he created this piece. It is a beautiful creation, both aesthetically and in taste. The red lavender glaze speaks of something really fiery and passionate but the truth couldn’t be further from this. 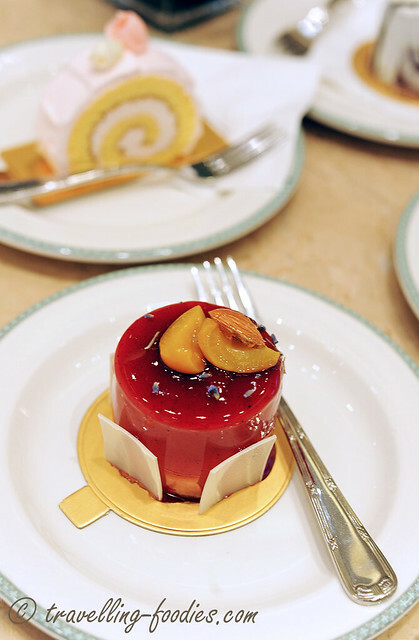 The interior apricot mousse is very soft and carried the delicate scent of the stone fruit. The mousse had uber tiny morsels of “demi-sec” apricot which burst into flavour as one bites into them. Overall a very enjoyable piece, and a very “visually and imagination inspiring” one for me. 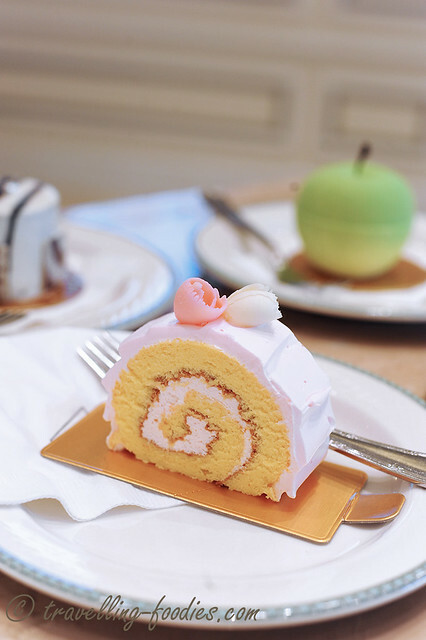 A sakura roll cake as our last piece. Given other choices, it is quite unlikely that we would order this. But given the circumstances that the pieces we had in mind are already gone, we settled for this simple roll cake nonetheless. The souffle sponge was very well made. J commented that the texture is the softest that he had ever eaten and I very much agree with him. However, the sakura scented cream is so subtly flavoured we could barely make out any hint of cherry blossoms in it, if not at all. Overall it is still a very delicious cake. The sponge for one is wonderfully made. But perhaps this piece is overshadowed and overwhelmed by the other pieces we’d tried earlier. That said, I think the flavours which had been intended could really be better worked through. On the whole, I think the standards of pastry making the Fine Foods is rather high. I’d enjoyed largely of the pieces we’d sampled and understood mostly what they were intended to express. We would definitely be here again to try the other pieces when the opportunity avails, hopefully in not too far away a future. 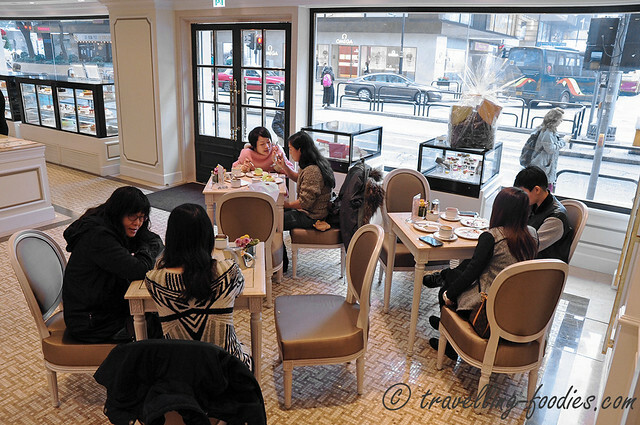 This entry was posted on June 25, 2014 by Alan (travellingfoodies). 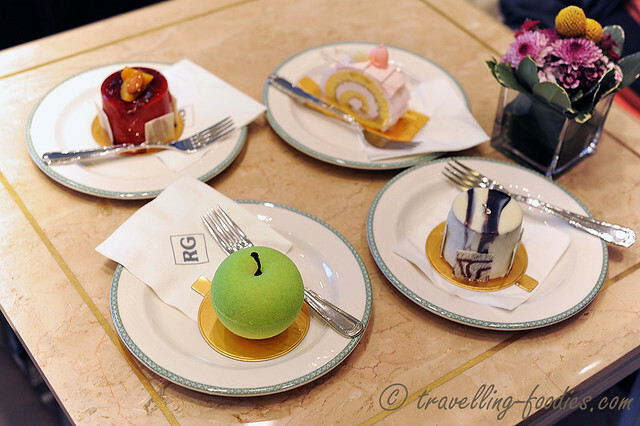 It was filed under Food, Travel and was tagged with apple compote, black sesame and vanilla gateau, 香港, fine foods, french pastry, green apple rare cheesecake, Hong Kong, lavender and apricot gateau, patissier, pâtisserie, royal garden, sakura roll cake, tsimshatsui, 尖沙咀. Wauwwww, that black sesame moose looks amazing; that would be my choice hands down. And I didn’t know that cocoa powder could be green; really? Is it green?! If you ate a piece of the white chocolate with a spoonful of the tart cheesecake custard, it would probably balance out the flavours.